"Great stamina and speed," says one commenter on the video. An impressive yet dizziness-inducing video of a YouTuber taking on one of the world's largest parkour courses is circulating online. For those who do not know, parkour refers to the activity of negotiating one's way through an area by running, jumping or climbing. It's like an obstacle course of sorts. 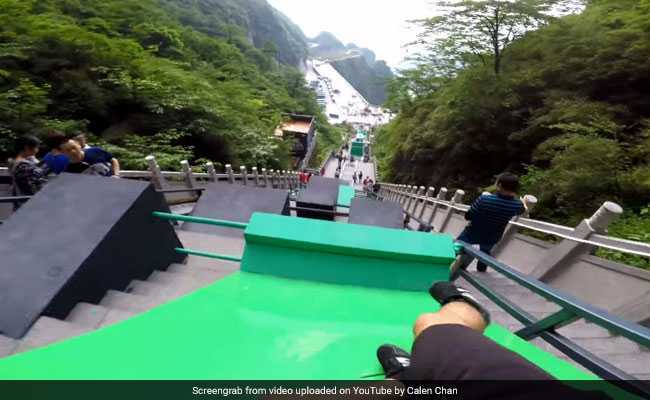 The video, posted by athlete Calen Chan, 19, shows him running down the Skyladder Parkour course at Tianman Mountain in China. "It has an average incline of 45 degrees, and is 999 steps long (about 3 football fields)!" he explains in the YouTube description of his video. A little over three minutes long, the video shows Calen jumping and running through the course. Chances are, you'll be panting just by watching him. "Obviously this was difficult, and I physically couldn't sprint down the entire path of deadly drops without slowing down, but I did my best," he says on YouTube, adding that he's the only person to do this with a camera in his mouth. "This is so incredibly long, how do you last that long," comments one YouTube user on the video. "I would've died on the first minute," says another. "Great stamina and speed," says one commenter. "I was there two weeks ago when they were building this. Your film doesn't show how steep the steps actually are. Total respect in taking on the course," says another.